Definition at line 22 of file KnownBits.h. Definition at line 33 of file KnownBits.h. Referenced by sext(), trunc(), zext(), and zextOrTrunc(). Create a known bits object of BitWidth bits initialized to unknown. Definition at line 36 of file KnownBits.h. Compute known bits resulting from adding LHS, RHS and a 1-bit Carry. Definition at line 47 of file KnownBits.cpp. References assert(), computeForAddCarry(), getBitWidth(), llvm::APInt::getBoolValue(), One, and Zero. Referenced by computeForAddSub(), llvm::SelectionDAG::computeKnownBits(), and countMaxPopulation(). Compute known bits resulting from adding LHS and RHS. Definition at line 54 of file KnownBits.cpp. References computeForAddCarry(), isNegative(), isNonNegative(), makeNegative(), makeNonNegative(), One, std::swap(), and Zero. Referenced by llvm::SelectionDAG::computeKnownBits(), computeKnownBitsAddSub(), computeKnownBitsFromOperator(), countMaxPopulation(), and ShrinkDemandedConstant(). Returns the maximum number of leading one bits possible. Definition at line 191 of file KnownBits.h. Returns the maximum number of leading zero bits possible. Definition at line 186 of file KnownBits.h. Referenced by llvm::SelectionDAG::computeKnownBits(), computeKnownBitsFromOperator(), isAlwaysLive(), and isKnownNonZero(). Returns the maximum number of bits that could be one. Definition at line 201 of file KnownBits.h. References llvm::MCID::Add, computeForAddCarry(), computeForAddSub(), llvm::APInt::countPopulation(), and getBitWidth(). Referenced by llvm::SelectionDAG::computeKnownBits(), computeKnownBitsFromOperator(), foldCtpop(), and llvm::SelectionDAG::isKnownToBeAPowerOfTwo(). Returns the maximum number of trailing one bits possible. Definition at line 181 of file KnownBits.h. Returns the maximum number of trailing zero bits possible. Definition at line 176 of file KnownBits.h. Referenced by llvm::SelectionDAG::computeKnownBits(), and isAlwaysLive(). Returns the minimum number of leading one bits. Definition at line 161 of file KnownBits.h. Referenced by llvm::SelectionDAG::computeKnownBits(), computeKnownBitsFromOperator(), countMinSignBits(), and llvm::InstCombiner::visitSwitchInst(). Returns the minimum number of leading zero bits. Definition at line 156 of file KnownBits.h. Referenced by combineSubToSubus(), combineVectorSignBitsTruncation(), llvm::SelectionDAG::computeKnownBits(), llvm::AMDGPUTargetLowering::computeKnownBitsForTargetNode(), llvm::X86TargetLowering::computeKnownBitsForTargetNode(), computeKnownBitsFromAssume(), computeKnownBitsFromOperator(), computeKnownBitsMul(), llvm::computeOverflowForUnsignedMul(), countMinSignBits(), llvm::RegsForValue::getCopyFromRegs(), isTruncateOf(), LowerAndToBT(), LowerTruncateVecI1(), llvm::AMDGPUTargetLowering::numBitsUnsigned(), llvm::AMDGPUTargetLowering::performShlCombine(), llvm::AMDGPUTargetLowering::performTruncateCombine(), ShrinkDemandedConstant(), SimplifyAndInst(), SimplifyLShrInst(), and llvm::InstCombiner::visitSwitchInst(). Returns the number of bits known to be one. Definition at line 196 of file KnownBits.h. Referenced by foldCtpop(), and llvm::SelectionDAG::isKnownToBeAPowerOfTwo(). Returns the number of times the sign bit is replicated into the other bits. Definition at line 167 of file KnownBits.h. References countMinLeadingOnes(), countMinLeadingZeros(), isNegative(), and isNonNegative(). Referenced by llvm::AMDGPUTargetLowering::computeKnownBitsForTargetNode(), and ComputeNumSignBitsImpl(). Returns the minimum number of trailing one bits. Definition at line 151 of file KnownBits.h. Returns the minimum number of trailing zero bits. Definition at line 146 of file KnownBits.h. Referenced by BrPHIToSelect(), llvm::SelectionDAG::computeKnownBits(), llvm::AMDGPUTargetLowering::computeKnownBitsForTargetNode(), computeKnownBitsFromOperator(), computeKnownBitsMul(), llvm::SelectionDAG::InferPtrAlignment(), isKnownNonZero(), isWordAligned(), llvm::InstCombiner::replacedSelectWithOperand(), and SimplifyShift(). Definition at line 39 of file KnownBits.h. Referenced by computeForAddCarry(), computeKnownBits(), computeKnownBitsAddSub(), llvm::LanaiTargetLowering::computeKnownBitsForTargetNode(), llvm::AArch64TargetLowering::computeKnownBitsForTargetNode(), llvm::AMDGPUTargetLowering::computeKnownBitsForTargetNode(), llvm::ARMTargetLowering::computeKnownBitsForTargetNode(), llvm::SystemZTargetLowering::computeKnownBitsForTargetNode(), llvm::X86TargetLowering::computeKnownBitsForTargetNode(), computeKnownBitsFromAssume(), computeKnownBitsFromOperator(), llvm::computeKnownBitsFromRangeMetadata(), computeKnownBitsFromShiftOperator(), computeKnownBitsMul(), computeSignedMinMaxValuesFromKnownBits(), computeUnsignedMinMaxValuesFromKnownBits(), countMaxPopulation(), llvm::XCoreTargetLowering::EmitInstrWithCustomInserter(), llvm::ConstantRange::fromKnownBits(), llvm::FunctionLoweringInfo::GetLiveOutRegInfo(), isConstant(), isTruncateOf(), llvm::AMDGPUTargetLowering::performTruncateCombine(), ShrinkDemandedConstant(), llvm::TargetLowering::SimplifyDemandedBits(), SimplifyShift(), tryBitfieldInsertOpFromOr(), llvm::InstCombiner::visitSwitchInst(), zext(), and zextOrTrunc(). Returns the value when all bits have a known value. This just returns One with a protective assertion. Definition at line 56 of file KnownBits.h. References assert(), isConstant(), and One. Referenced by llvm::ConstantFoldLoadFromConstPtr(), llvm::AMDGPUTargetLowering::performTruncateCombine(), llvm::InstCombiner::run(), llvm::SimplifyInstruction(), and llvm::InstCombiner::visitReturnInst(). Definition at line 46 of file KnownBits.h. Referenced by llvm::SelectionDAG::computeKnownBits(), computeKnownBitsFromShiftOperator(), computeKnownBitsMul(), llvm::ConstantRange::fromKnownBits(), isAllOnes(), isConstant(), isZero(), ShrinkDemandedConstant(), llvm::TargetLowering::SimplifyDemandedBits(), and llvm::X86TargetLowering::SimplifyDemandedBitsForTargetNode(). Returns true if value is all one bits. Definition at line 77 of file KnownBits.h. References assert(), hasConflict(), and llvm::APInt::isAllOnesValue(). Referenced by computeKnownBitsFromAssume(), and llvm::InstCombiner::visitCallInst(). Returns true if we know the value of all bits. Definition at line 49 of file KnownBits.h. References assert(), llvm::APInt::countPopulation(), getBitWidth(), and hasConflict(). Referenced by llvm::ConstantFoldLoadFromConstPtr(), getConstant(), llvm::AMDGPUTargetLowering::performTruncateCombine(), llvm::InstCombiner::run(), llvm::SimplifyInstruction(), and llvm::InstCombiner::visitReturnInst(). Definition at line 95 of file KnownBits.h. Referenced by aliasSameBasePointerGEPs(), computeForAddSub(), llvm::AMDGPUTargetLowering::computeKnownBitsForTargetNode(), computeKnownBitsFromAssume(), computeKnownBitsFromOperator(), computeKnownBitsMul(), llvm::SelectionDAG::ComputeNumSignBits(), computeRecurrenceType(), countMinSignBits(), EvaluateConstantChrecAtConstant(), llvm::ConstantRange::fromKnownBits(), llvm::isKnownNegative(), isKnownNonZero(), simplifyICmpWithBinOp(), and simplifyICmpWithZero(). Definition at line 98 of file KnownBits.h. Referenced by aliasSameBasePointerGEPs(), canReplaceGEPIdxWithZero(), computeForAddSub(), llvm::AMDGPUTargetLowering::computeKnownBitsForTargetNode(), computeKnownBitsFromAssume(), computeKnownBitsFromOperator(), computeKnownBitsMul(), llvm::slpvectorizer::BoUpSLP::computeMinimumValueSizes(), llvm::SelectionDAG::ComputeNumSignBits(), ComputeNumSignBitsImpl(), llvm::computeOverflowForSignedMul(), computeRecurrenceType(), countMinSignBits(), EvaluateConstantChrecAtConstant(), llvm::ConstantRange::fromKnownBits(), llvm::isKnownNonNegative(), isKnownNonZero(), ShrinkDemandedConstant(), simplifyICmpWithBinOp(), simplifyICmpWithZero(), llvm::InstCombiner::simplifyRangeCheck(), and llvm::InstCombiner::visitSExt(). Returns true if we don't know any bits. Definition at line 62 of file KnownBits.h. Referenced by llvm::FunctionLoweringInfo::AddLiveOutRegInfo(), llvm::SelectionDAG::computeKnownBits(), llvm::ARMTargetLowering::computeKnownBitsForTargetNode(), llvm::X86TargetLowering::computeKnownBitsForTargetNode(), and llvm::ConstantRange::fromKnownBits(). Returns true if value is all zero. Definition at line 71 of file KnownBits.h. Referenced by computeKnownBitsFromAssume(), isZero(), and llvm::InstCombiner::replacedSelectWithOperand(). Definition at line 101 of file KnownBits.h. Referenced by computeForAddSub(), computeKnownBitsFromAssume(), computeKnownBitsFromOperator(), and computeKnownBitsMul(). Definition at line 106 of file KnownBits.h. Referenced by computeForAddSub(), computeKnownBitsFromAssume(), computeKnownBitsFromOperator(), computeKnownBitsMul(), and ShrinkDemandedConstant(). Resets the known state of all bits. Definition at line 65 of file KnownBits.h. Referenced by computeKnownBits(), llvm::SelectionDAG::computeKnownBits(), llvm::SparcTargetLowering::computeKnownBitsForTargetNode(), llvm::AMDGPUTargetLowering::computeKnownBitsForTargetNode(), llvm::ARMTargetLowering::computeKnownBitsForTargetNode(), llvm::SystemZTargetLowering::computeKnownBitsForTargetNode(), llvm::PPCTargetLowering::computeKnownBitsForTargetNode(), llvm::X86TargetLowering::computeKnownBitsForTargetNode(), llvm::TargetLowering::computeKnownBitsForTargetNode(), computeKnownBitsFromAssume(), computeKnownBitsFromOperator(), computeKnownBitsFromShiftOperator(), computeKnownBitsMul(), llvm::XCoreTargetLowering::EmitInstrWithCustomInserter(), and ShrinkDemandedConstant(). Make all bits known to be one and discard any previous information. Definition at line 89 of file KnownBits.h. Make all bits known to be zero and discard any previous information. Definition at line 83 of file KnownBits.h. Referenced by computeKnownBits(), llvm::X86TargetLowering::computeKnownBitsForTargetNode(), computeKnownBitsFromAssume(), and computeKnownBitsFromShiftOperator(). Sign extends the underlying known Zero and One bits. This is equivalent to sign extending the value we're tracking. Definition at line 130 of file KnownBits.h. Referenced by llvm::SelectionDAG::computeKnownBits(), llvm::ARMTargetLowering::computeKnownBitsForTargetNode(), llvm::SystemZTargetLowering::computeKnownBitsForTargetNode(), computeKnownBitsFromOperator(), and ShrinkDemandedConstant(). Truncate the underlying known Zero and One bits. This is equivalent to truncating the value we're tracking. Definition at line 112 of file KnownBits.h. Referenced by llvm::SelectionDAG::computeKnownBits(), llvm::AMDGPUTargetLowering::computeKnownBitsForTargetNode(), llvm::X86TargetLowering::computeKnownBitsForTargetNode(), computeKnownBitsFromOperator(), llvm::TargetLowering::SimplifyDemandedBits(), and llvm::X86TargetLowering::SimplifyDemandedBitsForTargetNode(). Extends the underlying known Zero and One bits. By setting ExtendedBitsAreKnownZero=true this will be equivalent to zero extending the value we're tracking. With ExtendedBitsAreKnownZero=false the extended bits are set to unknown. Definition at line 120 of file KnownBits.h. References getBitWidth(), KnownBits(), llvm::APInt::setBitsFrom(), and llvm::APInt::zext(). Referenced by llvm::SelectionDAG::computeKnownBits(), llvm::ARMTargetLowering::computeKnownBitsForTargetNode(), llvm::SystemZTargetLowering::computeKnownBitsForTargetNode(), llvm::FunctionLoweringInfo::GetLiveOutRegInfo(), llvm::X86TargetLowering::SimplifyDemandedBitsForTargetNode(), and zextOrTrunc(). Extends or truncates the underlying known Zero and One bits. 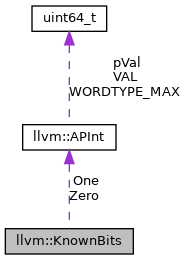 When extending the extended bits can either be set as known zero (if ExtendedBitsAreKnownZero=true) or as unknown (if ExtendedBitsAreKnownZero=false). Definition at line 138 of file KnownBits.h. References getBitWidth(), KnownBits(), zext(), and llvm::APInt::zextOrTrunc(). Referenced by llvm::SystemZTargetLowering::computeKnownBitsForTargetNode(), llvm::X86TargetLowering::computeKnownBitsForTargetNode(), computeKnownBitsFromOperator(), ShrinkDemandedConstant(), and llvm::TargetLowering::SimplifyDemandedBits(). Definition at line 24 of file KnownBits.h. Referenced by llvm::FunctionLoweringInfo::AddLiveOutRegInfo(), aliasSameBasePointerGEPs(), calculateByteProvider(), canonicalizeSaturatedAdd(), llvm::SelectionDAGISel::CheckOrMask(), computeForAddCarry(), computeForAddCarry(), computeForAddSub(), computeKnownBits(), llvm::SelectionDAG::computeKnownBits(), computeKnownBitsBinOp(), llvm::SparcTargetLowering::computeKnownBitsForTargetNode(), llvm::LanaiTargetLowering::computeKnownBitsForTargetNode(), llvm::AArch64TargetLowering::computeKnownBitsForTargetNode(), llvm::AMDGPUTargetLowering::computeKnownBitsForTargetNode(), llvm::ARMTargetLowering::computeKnownBitsForTargetNode(), llvm::X86TargetLowering::computeKnownBitsForTargetNode(), computeKnownBitsFromAssume(), computeKnownBitsFromOperator(), llvm::computeKnownBitsFromRangeMetadata(), computeKnownBitsFromShiftOperator(), computeKnownBitsMul(), llvm::SelectionDAG::ComputeNumSignBits(), llvm::computeOverflowForUnsignedMul(), llvm::FunctionLoweringInfo::ComputePHILiveOutRegInfo(), computeSignedMinMaxValuesFromKnownBits(), computeUnsignedMinMaxValuesFromKnownBits(), llvm::ConstantFoldLoadFromConstPtr(), eliminateDeadSwitchCases(), llvm::ConstantRange::fromKnownBits(), generateEquivalentSub(), getConstant(), GetRangeFromMetadata(), isAlwaysLive(), isKnownNonEqual(), isKnownNonZero(), isKnownToBeAPowerOfTwo(), isOpcWithIntImmediate(), maskMatters(), processUGT_ADDCST_ADD(), llvm::InstCombiner::replacedSelectWithOperand(), ShrinkDemandedConstant(), llvm::TargetLowering::SimplifyDemandedBits(), llvm::X86TargetLowering::SimplifyDemandedBitsForTargetNode(), SimplifyRightShift(), SimplifyShift(), and llvm::InstCombiner::visitTrunc(). Definition at line 23 of file KnownBits.h. Referenced by llvm::FunctionLoweringInfo::AddLiveOutRegInfo(), adjustForRedundantAnd(), aliasSameBasePointerGEPs(), calculateByteProvider(), canonicalizeSaturatedAdd(), canTransformToMemCmp(), computeForAddCarry(), computeForAddCarry(), computeForAddSub(), computeKnownBits(), llvm::SelectionDAG::computeKnownBits(), computeKnownBitsBinOp(), llvm::SITargetLowering::computeKnownBitsForFrameIndex(), llvm::TargetLowering::computeKnownBitsForFrameIndex(), llvm::SparcTargetLowering::computeKnownBitsForTargetNode(), llvm::LanaiTargetLowering::computeKnownBitsForTargetNode(), llvm::AArch64TargetLowering::computeKnownBitsForTargetNode(), llvm::AMDGPUTargetLowering::computeKnownBitsForTargetNode(), llvm::ARMTargetLowering::computeKnownBitsForTargetNode(), llvm::SystemZTargetLowering::computeKnownBitsForTargetNode(), llvm::PPCTargetLowering::computeKnownBitsForTargetNode(), llvm::X86TargetLowering::computeKnownBitsForTargetNode(), computeKnownBitsFromAssume(), computeKnownBitsFromOperator(), llvm::computeKnownBitsFromRangeMetadata(), computeKnownBitsFromShiftOperator(), computeKnownBitsMul(), llvm::SelectionDAG::ComputeNumSignBits(), ComputeNumSignBitsImpl(), llvm::computeOverflowForUnsignedMul(), llvm::SelectionDAG::computeOverflowKind(), llvm::FunctionLoweringInfo::ComputePHILiveOutRegInfo(), computeSignedMinMaxValuesFromKnownBits(), computeUnsignedMinMaxValuesFromKnownBits(), llvm::ConstantFoldLoadFromConstPtr(), eliminateDeadSwitchCases(), llvm::XCoreTargetLowering::EmitInstrWithCustomInserter(), llvm::ConstantRange::fromKnownBits(), generateEquivalentSub(), getRangeForAffineARHelper(), GetRangeFromMetadata(), llvm::SelectionDAG::haveNoCommonBitsSet(), insertDAGNode(), isAlwaysLive(), isBitfieldPositioningOp(), isKnownNonEqual(), isKnownToBeAPowerOfTwo(), isOpcWithIntImmediate(), isSupportedGuardInstruction(), isTruePredicate(), isTruncateOf(), LowerMUL(), MaskedValueIsZero(), maskMatters(), matchRotateSub(), mayUseP9Setb(), llvm::ARMTargetLowering::PerformCMOVCombine(), llvm::ARMTargetLowering::PerformCMOVToBFICombine(), processUGT_ADDCST_ADD(), propagateMetadata(), llvm::InstCombiner::replacedSelectWithOperand(), llvm::PPCTargetLowering::SelectAddressRegImm(), llvm::PPCTargetLowering::SelectAddressRegReg(), ShrinkDemandedConstant(), llvm::TargetLowering::SimplifyDemandedBits(), llvm::X86TargetLowering::SimplifyDemandedBitsForTargetNode(), tryBitfieldInsertOpFromOr(), tryBitfieldInsertOpFromOrAndImm(), llvm::InstCombiner::visitAdd(), llvm::InstCombiner::visitSub(), llvm::InstCombiner::visitTrunc(), and llvm::InstCombiner::visitZExt().